Posted On October 07, 2016 by Team iCynosure. When she saw the dark clouds of expressions mirrored on my face, she smiled a little, consoling me, "Let the cloudburst, let's dance in the rain together." And that was the beginning for us. 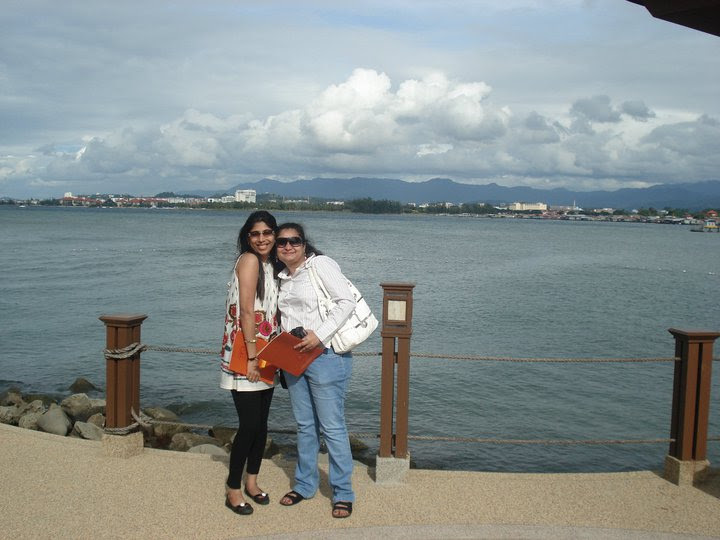 Meeta and I grew up together; as different as chalk and cheese, yet as similar as the beauty of emotion. She was a quiet mouse, I was the wild monkey. Our differences brought a balance to our relationship, at the same time testing our patience being with each other. Like any other friends we too have our share of memorable times with each other that we cherish and remember in small doses until we meet again to create new memories. Living in different cities has not taken a toll on our relationship, it has intact made the 'girls night out' more exciting and fun. Our time together is so precious, it feels like we just pick up from where we left off last time, much to the amazement of our hubbies. The last time we met was when Meeta was in transit and we caught up in Goa. Reminiscing our times in the land of sun and sand, we drifted into #YaaronKiBaraat trying to actually count the number of times we sneaked away from home to land in Goa. Though we failed to arrive at a number, our memories did bring back a funny episode. The year we were officially declared teenagers by everyone, we twisted our ways into getting approval for an all girl-trip to Goa. It was beautiful, the beach was fierce, wild and inviting. As we stepped out of the hotel straight into the beach we saw a line of docked Jet Skis. I suggested we go for a spin while Meeta cautioned me against it. “Since when did you learn to drive a BIKE?” she demanded. I hadn’t, but how different would it be than riding a cycle, I thought? Confidently I strode ahead and asked about renting the ski for half hour. After a zillion questions, a double deposit and a little verbal training, we started our voyage. Meets looked back and shouted for two life jackets. Already we began to move, I was cautious at first and then we relaxed a bit and we enjoyed our time in the water. As the time to head back neared, I saw the attendant waving at us. Meeta mentioned how much fun we had while I was trying to remember how to stop the beast. I looked ahead and could literally see the shore approaching faster than what I had anticipated, and I panicked. "How to stop this?" I screamed, and all Meeta could do is look at me in the eye, stare for what seemed an eternity and whisper a prayer. "Switch the damn thing off as soon as we hit the shore" she yelled. As soon as I hit stop I could see explosions in my head, but all that really happened was that the bike nose-dived into the sand and we were flung into the air, to land on the sand. We hung in there for a while, literally kissed the earth and hugged each other in dramatic theatrical expressions while the poor attendant looked on. As we recollected our moments together, not only did we Celebrate the Taste of Togetherness From A to Z, Faster than Faster to ensure Ummeed se Saje Zindagi. And that's what Zee TV's new chat show Yaaron Ki Baraat is all about; friendships put to test through a series of fun challenges and tasks. I'm really excited to watch the series; especially with the line-up of super celebrity friendships and the crazy hosts. 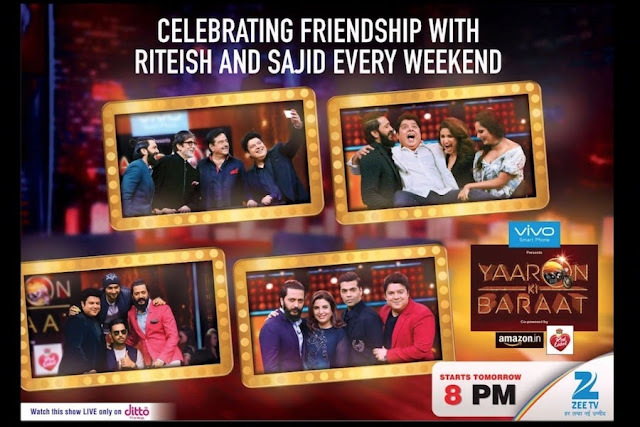 History will be created, as the show brings together two living legends of Indian cinema for the very time on a television. Sharing sepia-toned memories and heart-warming anecdotes from a friendship that spans over four decades; that fans haven’t had enough of. Recreating the magic from films like Dostana, Bombay to Goa, Naseeb, Kaala Patthar and Shaan, Amitabh Bachchan and Shatrughan Sinha will spill the beans on their friendship. Tune in to ZEE TV at 8 PM on 8th October to witness the magic.